Are your people “keeping their heads down” and working for the next paycheck? 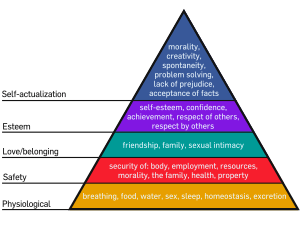 Take a quick peek at Maslow’s Hierarchy of Needs and you’ll see that the paycheck (pursuit of basic necessities) ranks at the bottom, while the things that motivate people to do better get stronger as one moves to the top of the pyramid. It is when people are motivated by the top two levels of the pyramid that amazing things happen and people perform at very high levels. It has long been known that the best managers help their people feel like a team, supported fully by management, with everyone focused on common goals and feeling their contribution is important. Sadly, few people have had the chance to experience that kind of management. As a manager you can make it happen, though, with noticeable benefits to you, your employees, your company, and your customers. Productivity can vary by a large amount, and rests mostly on how people feel about their jobs. When people feel unappreciated and prevented from contributing they get frustrated and become less productive. The productivity decrease is not their fault, as it is the way the business system is designed and run that discourages them or fails to engage them, and it is nearly impossible to be highly productive when you find yourself blocked from getting the job done by poor system design, poor quality tools, and bureaucratic red tape. It is the manager’s job to enable people’s best efforts, manage system design, provide the best possible tools, and cut through the red tape. As a manager you have at least some ability to do these things (and there is little better you can do). Inefficiency and plodding can become a cultural norm. Where such condition have persisted for a long time, inefficiency becomes a cultural norm and new employees, entering the business with enthusiasm and a will to make a positive difference, end up feeling beaten down and cooped up, prevented from doing their best work. Whether they stay long or leave for better jobs is directly affected by their perception of the business, their position in it, and their perceived ability to contribute. In an unengaged and poorly motivated setting those who are intent on doing well and those with skills in demand in the outside world will not stick around, and the organization will slowly approach a state where it is full of only the people who aren’t as marketable or who have external reasons to stay (which may include factors as simple as a fear of being out of work or a loved one who needs special care). The people who stay in such a mediocre environment will spend their work days basically “doing what they are told” and trying to survive to the next paycheck. They are unlikely to think creatively and improve process and product, which is a great loss to the organization. While you are not getting their best, you can’t blame them. * They are simply responding in a predictable human way to circumstances beyond their control. You, as manager, have at least some amount of control, however. The good news is you can do better. As a manager you should be working for a better situation than that, though admittedly it may be difficult in your current organization. Every manager is in the middle between higher-ups and employees, even if those higher-ups are the board of directors, so every manager has the potential to establish a productive culture in the organization under them, and every manager has to justify their approach to superiors. This is always easier once the improved results are measurable, but some organizations don’t support management with meaningful measurements. Still, the goal is too good to ignore and try for. Good management training is available, but you must get it for yourself. You can learn about team building and positive motivation, and about engaging people in achieving important business goals while helping them feel like part of an important endeavor. You can help people find challenges in the work, no matter what it is, and advance their knowledge so they can do even more, and it will make them feel better about themselves and their employer. And all of this can help you feel like a better manager, find more fulfillment in your own work life, and achieve noticeably better results, too. If you can, why don’t you? You want to feel appreciated and valued, too, don’t you? Even if your bosses don’t appreciate you, at least when you have an engaged and motivated team under you they will appreciate you, and that is all to the good. I have worked for companies where employees raced to open the door in the morning and had to be sent home to their families at the end of the day – they were having too much fun – and those organizations were amazingly productive, far more than less positively managed competitors. * footnote: I am not talking about those special case employees who have serious problems with attitude or behavior – there are rare “bad apples” – but average workers. In my experience more than 99% of people, given the chance, will work to feel better about themselves and their contributions, and if you can connect with this motivation everyone involved will feel and do better, including your company. This entry was posted on Monday, August 20th, 2012 at 6:29 pm and is filed under business management, corporate culture, organizational behavior, Uncategorized. You can follow any responses to this entry through the RSS 2.0 feed. You can leave a response, or trackback from your own site.